Pay your bill, set up a payment plan, and/or sign up for paperless billing. 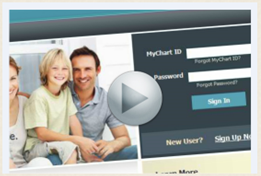 Connect to your childrens' accounts for access to their appointments, immunization records, growth charts, and more. Please note that MyChart should not be used for urgent situations. Please call your physician if the situation requires immediate attention, or dial 911 if it is a medical emergency. If you haven’t changed your password in a year or more, you will be asked to change it when signing in. This is being requested to better protect your privacy. For assistance with billing issues, please call 1-866-903-0436.